How to look sweet and edgy on a romantic date. It is the thing that separates us from every other creature in the known universe—this drive, this potential, this responsibility to love and be loved. It is what transforms mere existence into adventure; it’s the impetus for awe and wonder, gratitude and contentment. It is as much a commitment as it is a feeling toward oneself and the people around. Love commits to the kindness and patience necessary for deep relationship, and as it knits people together it further exposes the value of those involved—and not just any value, but a value that can neither be won nor lost. At its core, love discovers, and continually rediscovers, an intrinsic worth inside of people, and love responds to that discovery with action. From the article ‘Love Hate’ by Aaron Tucker for Darling Magazine‘s 10th issue. Had to share. For true lovers every day should be Valentine’s Day. If you are truly in love with someone EXPRESS YOUR LOVE every day, not just on February 14th. Even though I find Valentine’s Day highly overrated and commercialized, for me it’s just another excuse to show you guys how I put together a romantic and sweet outfit. When I purchased this skirt months ago, I already decided that this would be the main focus of my Valentine’s Day Outfit. It is comfortable, flowy and definitely makes a statement. 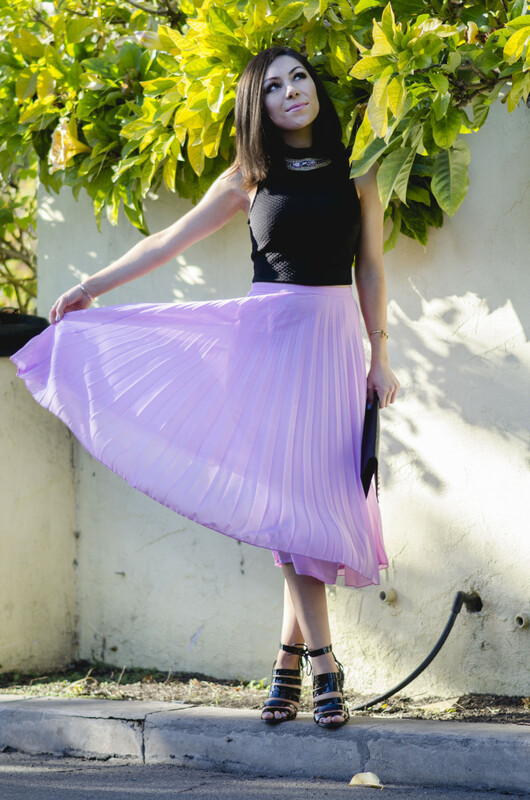 I feel like a princess aka Pink Valentine in this skirt. Wishing all lovers a Valentine’s Day filled with chocolate covered strawberries and kisses & cuddles from your Pink Valentine. That’s all we need, right? Bunny Bracelet: Urban Outfitters, Double bracelet set: Zara, Bunny ears rings: H&M- sold out but similar HERE! High-heels: Topshop – sold out but similar HERE! , Head piece: Forever 21 – sold out similar HERE!, Leather Jacket: Topshop – old, similar HERE!